In an emotional speech at the Wonderers Cricket Ground in South Africa, President Obama has urged African leaders to follow the footsteps of former South African President the late Nelson Madiba Mandela. 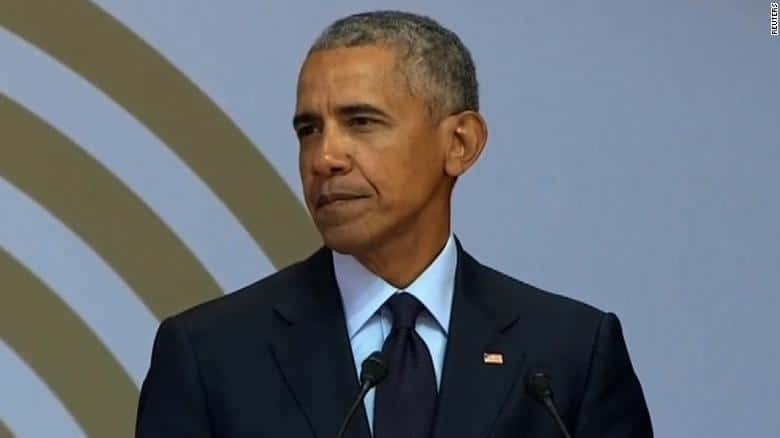 Obama was delivering a public lecture in commemoration of 100 years since the founding father of South Africa was born, where he called on Africans to rescind politics of fear, tribalism, corruption and discrimination. “Plain fact is that racial discrimination still exists in both the United States & in South Africa,” said Obama. “He (Mandela) came to embody the universal aspirations of dispossessed people all around the world with hopes for a better life, and the possibility of a moral transformation in the conduct of human affairs.I believe in Nelson Mandela’s vision. I believe in a vision shared by Gandhi and King and Abraham Lincoln. I believe in a vision of equality, justice, freedom and multi-racial democracy, built on the premise that all people are created equal,” he added, amidst cheers from the crowd. Obama further urged the young to remain true to the course of justice, and embrace one another irrespective of racial, tribal or ethnic background. “Madiba taught that you can be proud to be you and still embrace people who are different. Countries held together with rabid xenophobia, sectarianism and tribalism will eventually be consumed in civil wars,” warned Obama. The leader who has been on an African tour as a private citizen for the first time since he left office criticised leaders who steal public funds, amassing wealth for themselves and crippling their countries’ economies. “A few dozen individuals control the same amount of wealth as the poorest half of humanity. That’s not an exaggeration. It’s a statistic. We constantly have to be on the look out for those who seek to raise themselves by putting somebody else down,” remarked Obama. He praised the struggle Mandela underwent to redeem South Africa from apartheid, saying he was “one of the countless millions who drew inspiration from Nelson Mandela’s life”. As a student, Mr Obama called the fight against apartheid “a struggle that touches each and every one of us”, and encouraged his university to drop its investments in South Africa. He has also encouraged the world to harmonise the gap between the poor and the rich through proper economical systems, as well as ensuring social stability in all parts of the countries. He also urged countries to ensure free press and proper use of social media. Obama and his family spent eight days in Tanzania’s famous Serengeti National Park, before he traveled to Kenya at the weekend to visit his ancestral home, then flew to South Africa to deliver the public lecture.